A game of chance and skill. 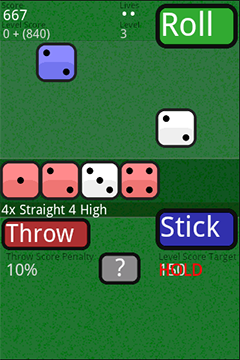 Build a high score by selecting the best scoring dice combinations. 1. Roll the dice to start the game. 5. Then you may select Stick to progress to next level. 6. Roll the dice to continue on the same level. An extra life is awarded every 10,000 points. 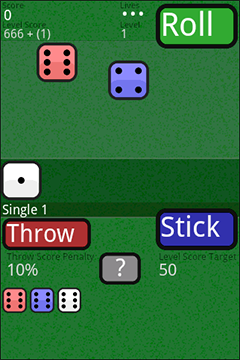 The current level target is displayed at the bottom right of the screen. Your level score must match or exceed this for you to be allowed to stick. The level target is increased by 50 each level, unless your level score matches or exceeds the current hold target, in which case the level target does not increase. This is indicated with a HOLD label displayed over the level target. If you think the odds of you making the level target are too low you can opt to throw the level and take a score penalty. The score penalty increases with each time you use the feature, until eventually it is disabled. 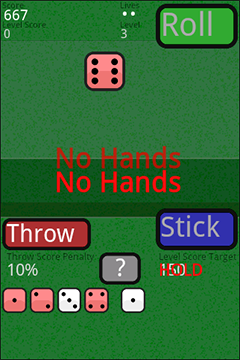 If the hand is also a flush (all the dice are the same colour) that the hand score is multiples by 1.5. Small PI, , scores 314! I believe there is an option to uninstall in Settings > Applications > Manage Applications > Dice Game. If that doesn't work, try restarting the phone and trying again.